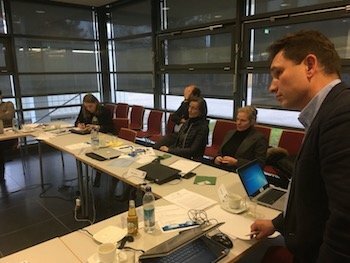 On November 15h, representatives from CERIC, ELI, the European Spallation Source, the Helmoltz-Centre Geesthachtand FRM II met in Garching to continue the development of a methodology for the monitoring and assessment of socio-economic returns of Research Infrastructures (RIs). During the workshop, the participants were introduced to the theory of change as a basic method for socio-economic impact assessment. The project’s partners then teamed up to adapt the theory to the different needs of their institutions. 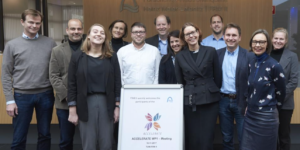 Under the guidance of experts in science system assessment – Leonie van Drooge and her fellows from the Rathenau Institute – the participants identified the first set of pathways and narratives through which the different RIs contribute to socio-economic development. 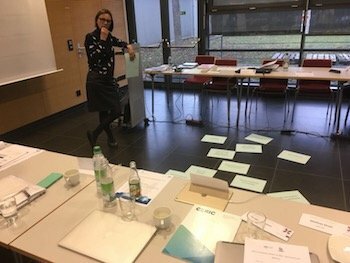 The information retrieved from the workshop represents an important ingredient for the final methodology, which will be developed in the upcoming months. The meeting was organised by the Rathenau Institute and is part of the ACCELERATE Work Package “Sustainability and Responding to Challenges”.